Published: April 2, 2013 at 04:42 p.m. Updated: April 8, 2013 at 10:31 p.m. In the days leading up to the 2013 NFL Draft, NFL.com will allow users to determine the best and worst draft picks for every team. We continue the proceedings with the team that owns the No. 10 overall pick in this year's draft, the Tennessee Titans. The "Tyler Rose" was a ball-carrying tour de force for the "Luv Ya Blue" Oilers teams that challenged the dynastic Pittsburgh Steelers in the late 1970s. Campbell -- a 1991 Pro Football Hall of Fame inductee -- produced one of the all-time signature plays for a running back in a 1978 game against the Los Angeles Rams, a 27-second living visual testament to his power. Campbell's career netted three rushing titles, an MVP award and one of the NFL's all-time great highlight reels. The Houston Oilers/Tennessee Oilers/Tennessee Titans city-to-city shift and rise from the ashes in the late 1990s was due to a talented two-man tandem in the backfield. A year after taking quarterback Steve McNair in the first round, the then-Oilers of Houston selected George -- the 1995 Heisman Trophy winner. George was a workhorse (five seasons with 330 or more carries), starting every game for the franchise -- 128 in all -- between 1996 and 2003. In the franchise's first season as the "Tennessee Titans," George anchored a memorable run toward Super Bowl XXXIV. Matthews was a pillar of the Oilers/Titans' offensive line in a career that spanned three decades. He played every position along the offensive line in that time. At the time of his retirement following the 2001 season, Matthews played in more games (296) than any other position player in league history. Matthews' 14 consecutive Pro Bowl selections ties Merlin Olsen for most all time. Matthews was inducted into the Pro Football Hall of Fame in 2007. After posting video-game numbers in a season for the ages at Alcorn State (which included finishing third in the Heisman Trophy voting), McNair was pegged by the then-Houston Oilers to be the successor to Warren Moon. McNair's transcendent skill, and effectiveness in teaming with George in the backfield, helped a vagabond franchise achieve stability and near-championship glory. McNair's effort in Super Bowl XXXIV is the stuff of legend, as his Titans came agonizingly close to achieving ultimate victory. For 11 seasons, Munchak teamed with Matthews to form a stabilizing front line that helped the Oilers rise from the depths of despair in the 1980s and become an epic offensive force by the 1990s. A nine-time Pro Bowler, Munchak was a stalwart at left guard for Houston, and was inducted into the Pro Football Hall of Fame in 2001. Enamored with a local speedster out of Middle Tennessee State, the Titans burned a second-round draft choice on Calico (who also added a height-weight dimension of 6-foot-4 and 220 pounds to his enticing draft profile). Calico started just eight games over three seasons with the Titans, for whom he reached the end zone just four times. Henry was another player whose intrigue grew in the time leading up to the draft. Henry dominated at the NFL Scouting Combine, ripping through the 40-yard dash in 4.40 seconds. Henry's time in Tennessee was brief and unproductive. In November of his rookie season, Henry was slapped with a four-game suspension for violating the league's substance abuse policy. Henry finished his rookie year with just 119 yards and two touchdowns. The next season was worse: One carry for three yards. A year later Henry was cut by the Titans. Before off-the-field conduct halted Jones' time in Tennessee, he was an electric return specialist and play-making cornerback (he had four picks in 2007, including one for a touchdown). However, things went south in the offseason prior to the 2007 season. A shooting incident during NBA All-Star Game weekend in Las Vegas prompted a season-long suspension for Jones, who entered the NFL with numerous red flags regarding character. For a player selected at No. 6 overall in the draft, Jones -- having since dropped "Pacman" to go by Adam Jones -- did not warrant the gamble taken by the Titans and lasted just two seasons in Tennessee. Troupe displayed a heaping helping of potential while playing college ball at Florida, and the Titans had hoped that would translate to the professional ranks. It didn't. Troupe lasted four seasons in Tennessee, where his production failed even to match that of another former Gator tight end, Erron Kinney. Neither player was able to fill the shoes of Titans legend Frank Wycheck, who retired following the 2003 season. What makes the selection of Woolfolk particularly painful for Titans fans is that Nnamdi Asomugha (No. 31 overall) and Charles Tillman (No. 35 overall) were picked shortly after the Oklahoma corner. That draft class also provided Rashean Mathis, Asante Samuel, Ike Taylor and Yeremiah Bell. 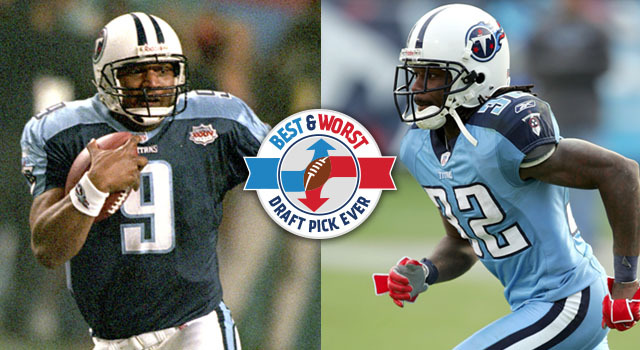 Rather than attain one of the handful of cornerbacks in the 2003 draft to go on to extremely productive, and lengthy, NFL careers, the Titans took a player who lasted just four seasons, made a total of 12 starts and picked off three passes.